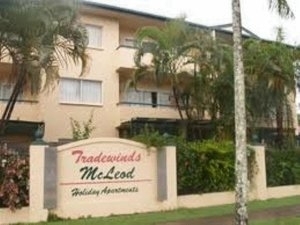 Tradewinds McLeod Holiday Apartments - A three level walkup complex offering spacious and well appointed 2 bedroom holiday apartments in a quiet location off the main road. Handy to local restaurants (3 minutes walk to supermarket), shops and a delightful 25 minute walk to Cairns CBD via the waterfront park. 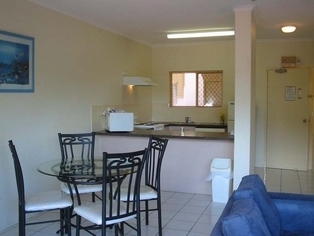 Each air-conditioned Apartment includes a fully equipped kitchen with microwave and dishwasher, laundry, spacious lounge/dining area and private balcony overlooking the tropical garden and/or pool. Most Apartments have a queen size bed and 2 single beds, a very limited number have 2 queen beds or 4 single beds. Ground floor Apartments include a patio. 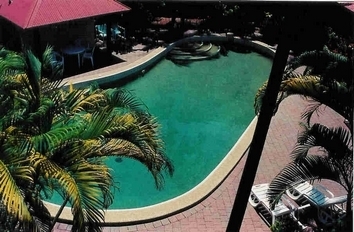 Facilities include a fenced entertainment area around a large free form saltwater swimming pool, gas fired BBQ and Gazebo for year round relaxation. Tour Booking service internet acces fax and safety deposit service and baby equipment hire. Baby sitting can be arranged. Friendly service, excellent facilities and competitive rates. Ideal destination for the business traveller, family holidays and small groups (4 ) travelling together. Fax facilities during office hours. Short distance to post office and major banks. Register at our reception office on arrival. Hours 7.30am to 6.00pm Monday to Friday. 8.00am to 3.00pm weekends and public holidays. Please notify us if after hours key collection is required. Extra person (1 only) $10 per night bed hire. Ample off street parking. Limited undercover parking available. From Brisbane, follow the well signposted Bruce Highway into Cairns CBD. After crossing the railway turn left into McLeod Street and move to the right hand lane. Continue for approx 1km or 8 blocks. We are number 191 on the left. A major tourist destination, Cairns offers a wide range of adventures and activities from diving, snorkelling, waterskiing, rafting and sailing. Paragliding, hangliding, skydiving and scenic joy flights. Scenic cruises to the Great Barrier Reef and fishing charters. Bushwalking trails and Balloon rides, visit the Daintree Rainforests and much more. Enjoy the spectacular scenery from the Kuranda Scenic train or the Skyrail over the rainforests. Visit the Tablelands, take a night wildlife tour or visit the Undara Lava Tubes. The waterfront Cairns Esplanade is only four blocks from the apartments and offers a cool alternative walk to the city hub and the Cairns Pier. The City offers excellent shopping, restaurants, theatres and entertainment venues. Tradewinds McLeod has a full tour desk and can arrange all tours to pick you up at the door. We can also arrange for a hire vehicle at competitive rates.